POLWIJK F, KLEEFSTRA R, VAN WINDEN E & ENS BJ (2018) Monitoring of sources of interference and disturbances as part of high tide roost counts in the Dutch Wadden Sea. 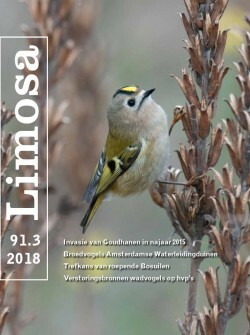 LIMOSA 91 (3): 131-143. Many birds depend on the Wadden Sea for breeding, wintering or to fattening up for their long migration towards either northern breeding or southern wintering grounds. To make optimal use of the Wadden Sea it is important that these birds are not disturbed. However, the Wadden Sea is a popular area for recreational activities and conflicts between birds and humans using the area seem inevitable. Besides humans, birds of prey can also cause disturbances. Too much disturbance can reduce bird survival. Assessing the impact of disturbance on birds is not easy, as there are many factors such as (group) size, weather, habituation and food availability that influence the response of a bird to a potential source of disturbance. However, monitoring potential sources of disturbance and visible reactions to these can give a clearer picture of the distribution of potential disturbance sources that are present and the times they affect birds. In this article, we analyzed comments on disturbance entered by volunteers during regular high tide roost counts in the Dutch Wadden Sea in the last ten years. Secondly, we analyzed the results of two integral Wadden Sea high tide counts on 20 August 2016 and 12 August 2017, i.e. at the height of the holiday season, when potential sources of disturbance and the visible effects they had on the birds were recorded by the surveyors. Finally, we analyzed the distribution and abundance of various birds of prey within the Dutch Wadden Sea. Potential sources of disturbance in the Wadden Sea, recorded during the pilot surveys in August 2016 and 2017, were mainly of anthropogenic origin (resp. 70% and 83% of all cases). In 30%, resp. 17%, of all cases it involved a natural predator. This closely resembles the results for the comments on disturbance noted during high tide counts between July 2005 and June 2016 (71% of disturbances had an anthropogenic and 29% a natural origin). The main source of disturbance in both cases were recreational activities, such as hiking. However, even though recreational activities most often lead to disturbance, their impact is minor. Extreme sports, like kite surfing, cause much more severe disturbances. As for the natural sources of disturbance, the Peregrine Falcon and Marsh Harrier were the most common causes of disturbance. Since the Peregrine Falcon is most abundant in winter and Marsh Harrier in summer, it appears that disturbance pressure from natural sources is present year-round, in contrast to human disturbance, which is most frequent during summer time. At present, White-tailed Eagles are too rare to cause significant disturbance, but this may change when numbers continue to increase. This article shows the value of a systematic recording of all potential sources of disturbance and the disturbance they cause during high tide. It is vital information for sketching the disturbance landscape, which in combination with information on the food landscape is ultimately needed for understanding the impact of disturbance on the distribution and abundance of birds in the Wadden Sea.